So a cousin has been busy posting photos to our family Facebook page. The page was started last year and surrounded a reunion I didn’t attend. I didn’t go for several reasons but the main one was that Mom had been ill, seriously ill, and I had a feeling I’d be going up to see her anyways. Just not to picnic. And I was right. So anyways, back to the pictures. There’s been some neat vintage-y ones. Some of Grandpa’s farm and barn, where this same cousin spent many a happy summer. And where I spent nearly every day of my childhood. And then came the photos of Christmases from years past. That gloriously long table of tables that seemed to stretch on forever; she’d decorate for days, arranging everything just so. Every plate and piece of silver was shined till it sparkled. Candles were lit, wee glasses of tomato juice poured, and scattered throughout were miniature trees and shiny delights, crystal pieces and breakable knick knacks that children weren’t supposed to touch but usually did. 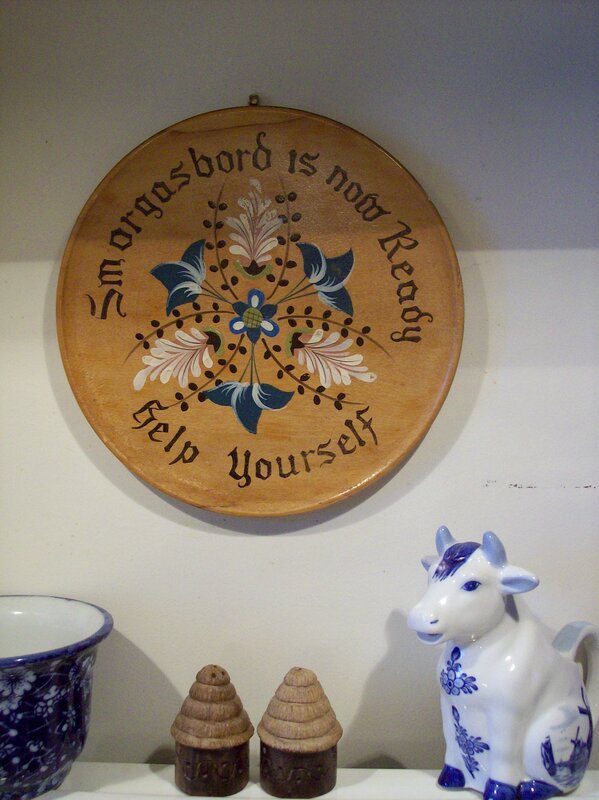 Plates of lefse, bowls of corn and potatoes. Everything absolutely glimmered. To a child … it was pure magic. What’s funny to me now is realizing that neither Grandma nor my Mom and Aunties are shown. The only ones sitting are the Dads & kids. That’s right, the women were in the kitchen, getting it done. Funny how things really don’t change all that much. 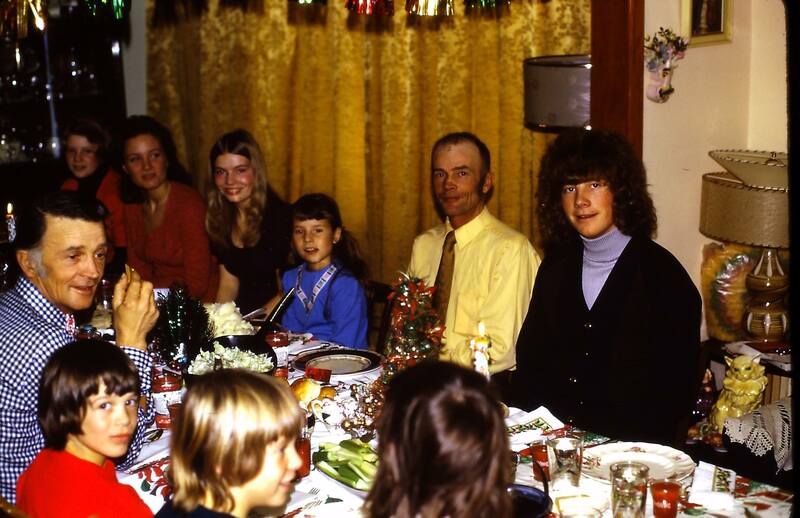 that’s me in blue, and no surprise that I’m sitting between my sister, Pat, and my Dad. But then, a day later, this picture appeared! This one, with Grandma standing, depicting her shy smile and the pride she took in all efforts. Everything on that table was prepared by her, for us. She didn’t allow anyone to bring a thing. They could help serve and clean up but that was it. 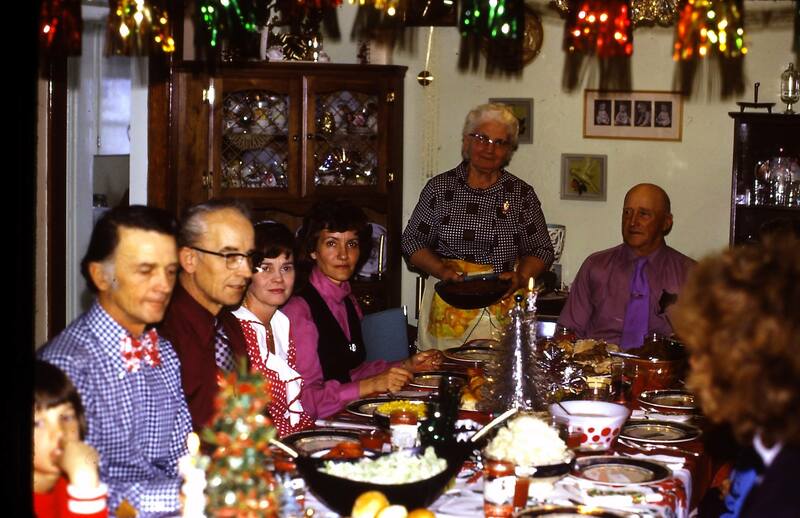 Grandpa, with his purple tie, is of course at the head of the table. I remember him nowhere else but there. Imagine my delight when this snap appeared! You see, I only have formal photos of Grandma. Photos at weddings, in dressy dresses, Grandpa in a suit. The trace of a smile. Now this is how I remember my Grandmother. Always wearing a dress, glasses resting on her rosy cheeks and her naturally curly hair tucked back with a comb. Her ample bosom and loyal apron; she gave the best hugs and smelled of vanilla, sugar and Cinnamon. This photo made my heart lurch forward; it brought forth a longing for her that is so deep, so intense that I can taste the tears that collect in the back of my throat. And when I look again at that picture I see my Mom’s beautiful smile, her cute figure and sparkly necklace. She was only 43 in this photo and I smile and cry when I realize I wear necklaces like that one, too. Here’s what’s so lovely to me about seeing that sign: it now hangs above my stove 1,400 miles away, in Michigan. No wonder I feel her with me when I cook! And when I think about the gift that a few dusty old photos have given me, I can’t help but smile at the bond that always connects us. The one that winds through generations and has the ability to transport us back to warm hugs on a winter’s day and kind words and Ladies who wore aprons and generously let small girls help them in their kitchens. And that, that to me, is like Christmas in July. Have you ever been transported to a moment, a feeling, a scent, via a photo? Do tell. Misty…that’s how I feel right now. Misty. You and I share similar upbringings. We were blessed. We didn’t know it then, we know it now. Fond memories of loving times past. Of people, conversations, of shared moments with loved ones. I’m familiar with how we extended the dining room table, with more tables and table clothes and more chairs (lets get everybody IN HERE). Of the men wearing ties for the holiday. Of something from Grandma’s kitchen that’s now in mine (a baked bean crock). Great post MJ. Thank you for sharing. Our “kids table” was in an adjoining room as well. 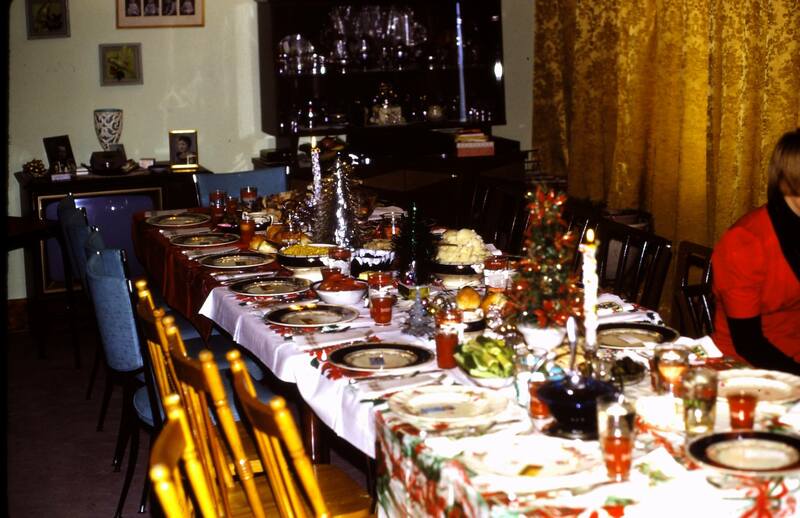 We host most of our families holiday meals and the kids (now in their 20’s and 30’s) still sit at the kids table while we adults crowd around the main table a few feet away in the dining room. My uncle Roger (a retired farmer in his late 70’s, who still works 10 hour days) likes to sit at the kids table and catch up on their lives. He’s a class act and doesn’t know it. Oh I love that Uncle Roger sits with the “kids” :). How fun! You are so lucky. My Dad’s mother died before I was born and I don’t remember my Mom’s mother who died when I was around 3. Everyone talks about them and I feel I missed out on so much. Family is the best! Mom and I were just commenting on how people don’t dress up for the Holidays anymore. Hubbs still does, I do some what (I’m the cook) … but I knew what she meant and she sounded rather wistful about it. That sense of belonging to something bigger than us was great for a kid — and my Mom and others made sure we kids understood the effort that our Grandmother put into every little thing she did for us. Treasures! Wow you were indeed blessed! Yes and then some — Aunties, Uncles, Cousins and more! It was always a magical, sparkly time to have Christmas at my Grandparents house! What a beautiful table. No wonder you were mesmerized by it – shucks, I am now. We have gotten away from so many of our traditions surrounding the holidays. One grandpa was adamant that no gift could be opened before Christmas Day. So we stayed up at his house on Christmas Eve, eating, playing, and anxiously waiting for midnight when the ribbons and paper could be ripped into shreds. Thanks for the memories. P. S. What is lefse? Lefse is a Scandinavian flatbread made with flour, riced potatoes, and cream. It’s rolled into circles and then ironed out flat with a special wand-like tool and dry cooked on a griddle. Norwegians (that I know anyways) eat it with butter and sugar, Swedes (like my family) eat it with just butter – rolled up and with the meal., as you would eat a roll. Sometimes people put leftovers in it, but it’s not tough like a tortilla and will break. Lefse (properly made) is buttery soft and delicious … and Grandma, who was Scottish, learned to make it for my Swedish Grandfather and his family :). I’ve made it with Mom and nowadays you can buy it ready made in the store around the Holidays but the “boughten” is never quite as good as homemade. Aw, what a sweet post! Bittersweet…. Thank you, those photos were a real gift to get. 1) have never seen them before and 2) never expected to = delightful! Beautiful table! Love all the tables it takes to assure a place for every one. I agree; she had a knack for making things lovely and pretty, treasured and special. We couldn’t help but appreciate the effort she took into making the Holiday so bright! 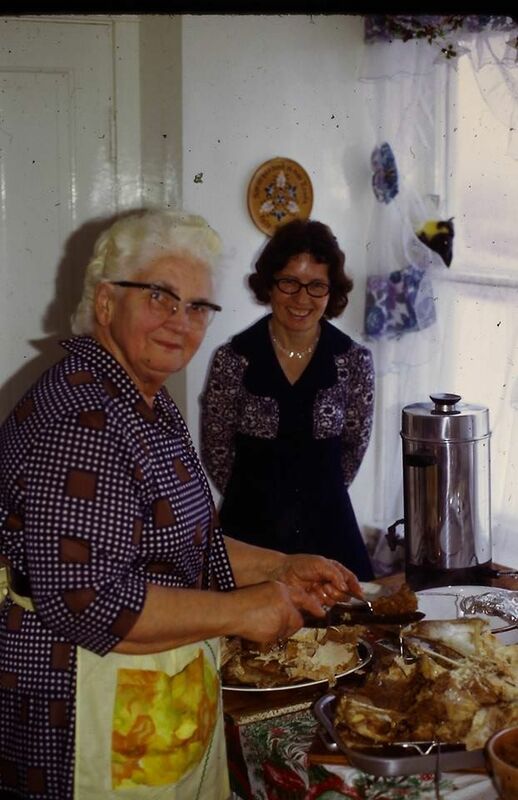 I get that same feeling when I remember my grandma, touch one of her recipes, see photos of her. She loved us so fully that even after all these years of her being gone, it sometimes still hurts so much it brings tears. This brought tears to my eyes. I wish my grandchildren would have memories like these, but alas miles and lack of cooking talent will leave no great moments like this for them to remember. I have memories like this.